When it comes to dining rooms, white might not be the first color you'd pick. But if you want a look that's classically chic, a white space is definitely the way to go. The end result is striking. Plus, a white backdrop makes it easy to tailor to your personal style. 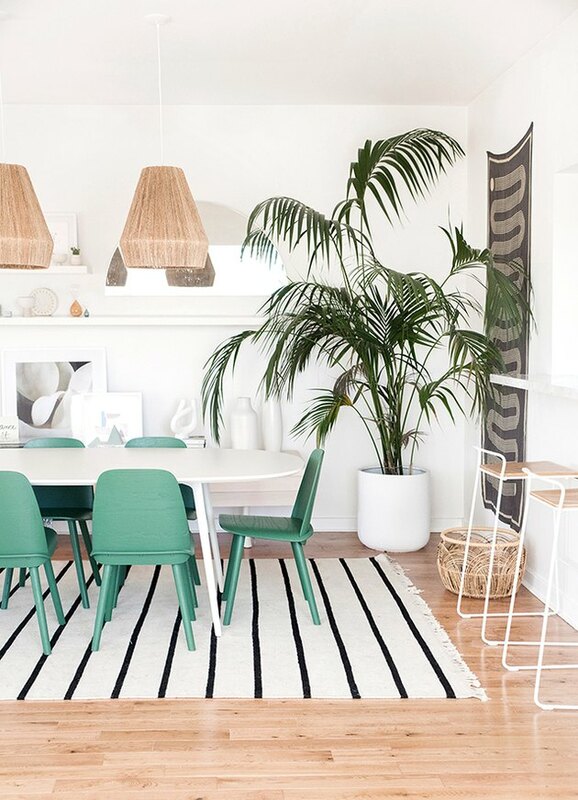 From modern, to farmhouse, to tropical, and more, these 13 stylish dining spaces prove that white will never go out of style. 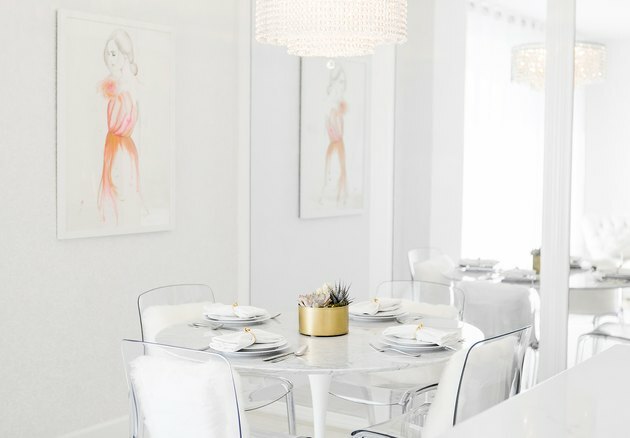 A wall of mirrors, sleek marble table top, and mod acrylic chairs work together to make Sydne's all-white West Hollywood dining room feel bright, airy, and bigger than it actually is. Fuzzy white pillows and a dramatic chandelier add contrasting texture which keep the space from feeling too sterile. If you've got gorgeous views, flaunt them! The minimalist decor in this sun-filled white dining room allow the big, picture-perfect windows to take center stage. 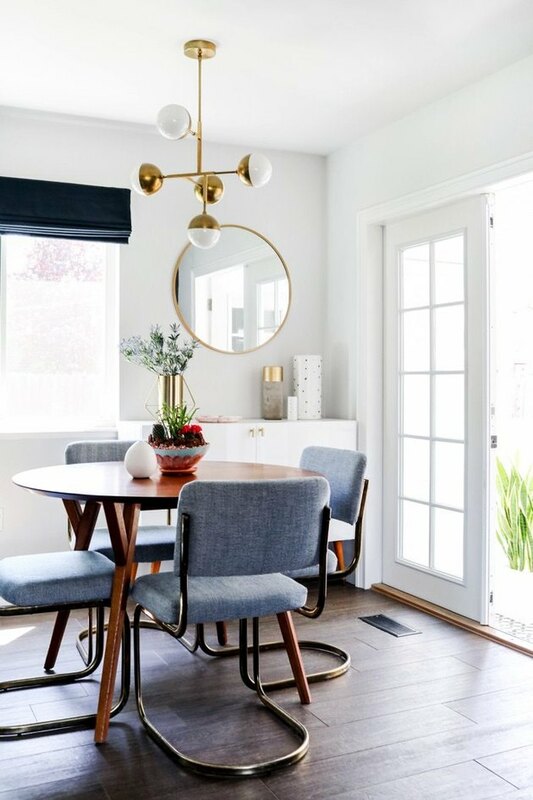 Brittany Chinaglia from The Vintage Rug Shop gave her white dining room a midcentury makeover with the help of a modern brass light fixture and tubular steel frame chairs. 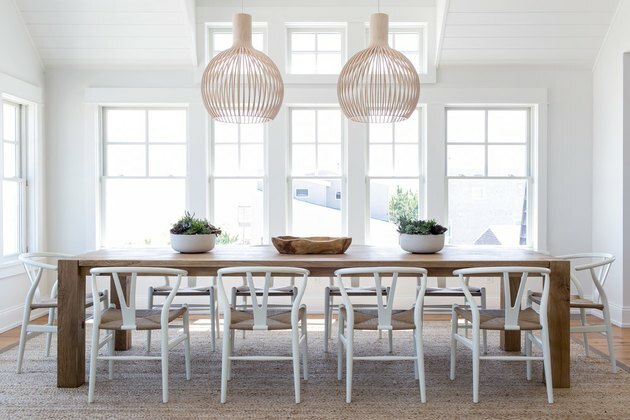 A farmhouse style table styled with white Wishbone chairs and statement-making pendant lights make this beach-chic space designed by Chango & Co. dining room goals. 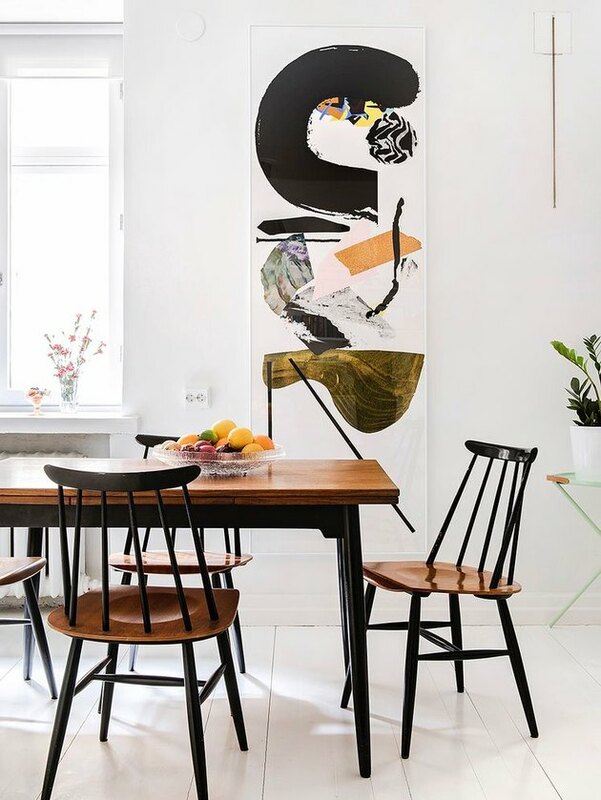 The all-white walls and flooring of this Helsinki apartment create the ideal backdrop for a signature piece of art to shine. The black accents from the dining chairs and table further highlight the inspired dining room, too. 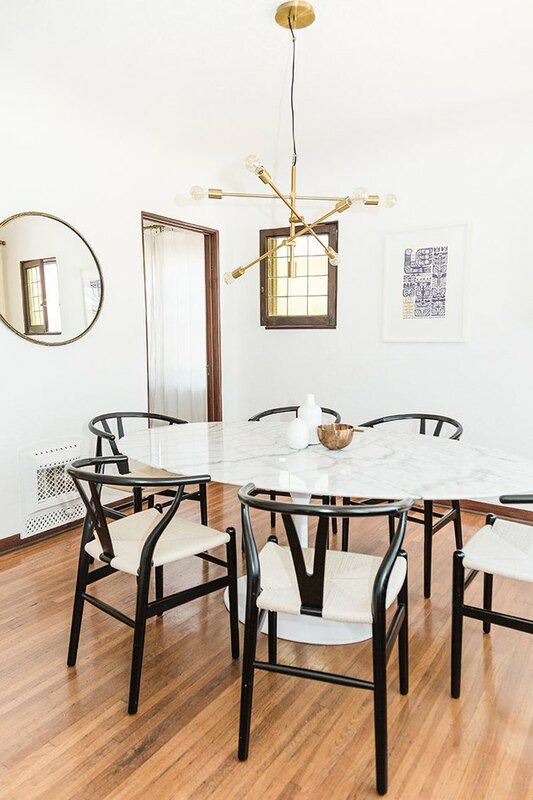 Sarah and Lou from A House In The Hills gave this white dining room some vintage personality thanks to retro furniture like a tulip style dining table and black Wishbone chairs. 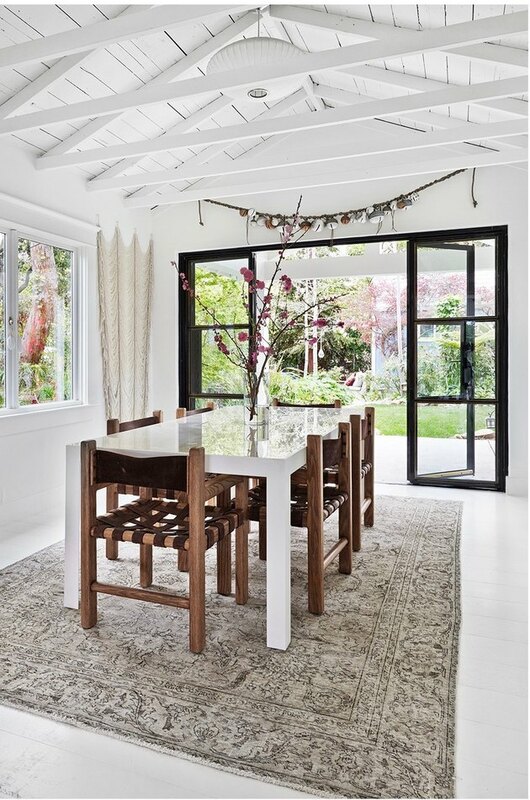 Interior designer Emily Henderson's casually chic white dining room, featuring a refinished farm table and pleated pendant light fixture, gets the updated traditional look right. Plus, it's totally kid-friendly since the chairs are covered in stain-resistant fabric, which is ultra durable and easy to clean. Bri from the blog Design Love Fest enlisted designer Sarah Sherman Samuel to help make over her dull dining room, and this serene space was the result of their collaboration. Clean lines, plus a few natural touches (like the jute pendants), give this white dining room peaceful, bohemian vibes. 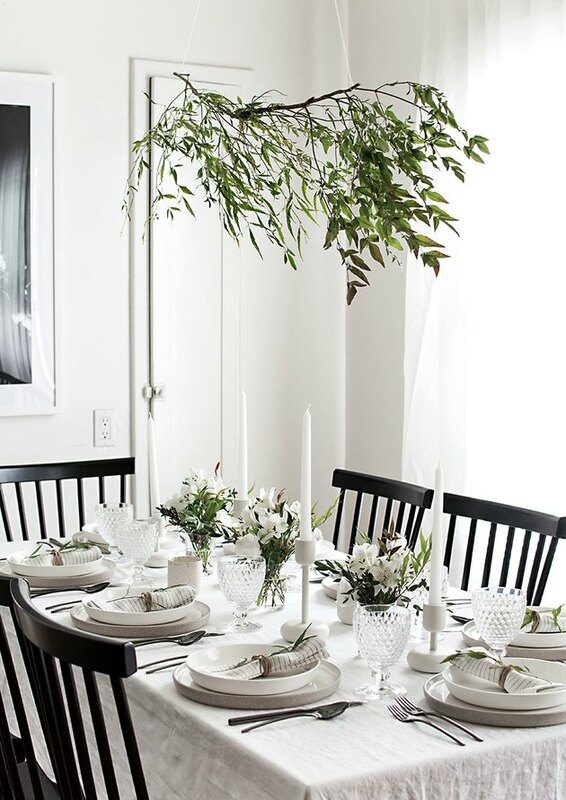 To keep a farmhouse style dining room from feeling too rustic, give it a modern touch by painting everything white. 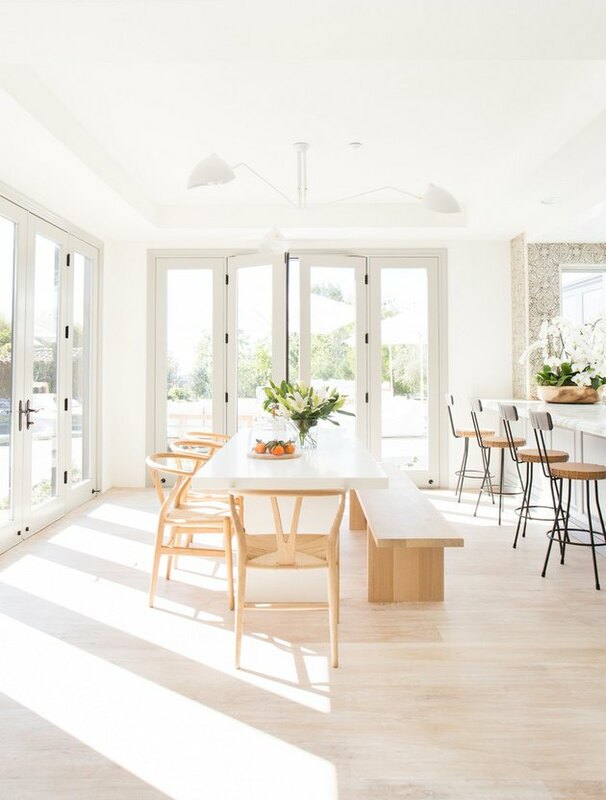 From the walls, to the floor, to the post and beam wood ceiling, to the sturdy dining table, having an all-white shell and decorative accents helps keep the space feeling light and bright. 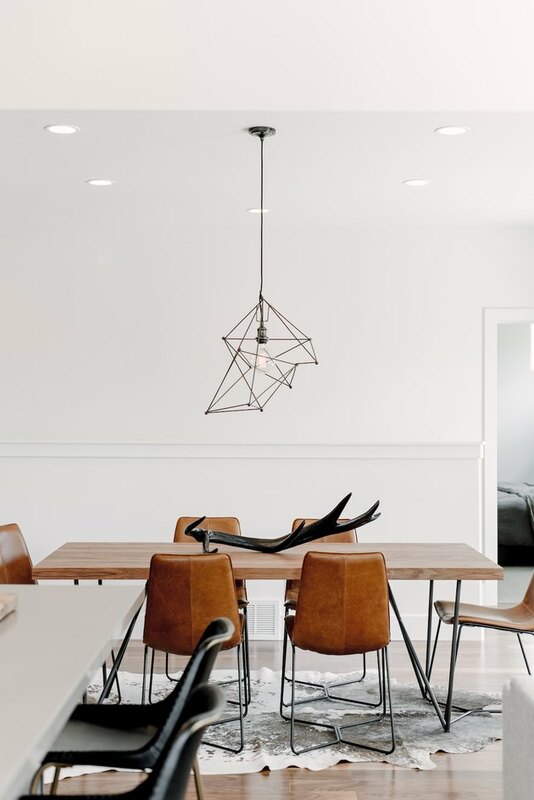 In this white dining room in Utah, the abstract metal pendant and steel frame table and chairs add a decisively industrial feel to the space, while the leather upholstery and area rug warm things up. 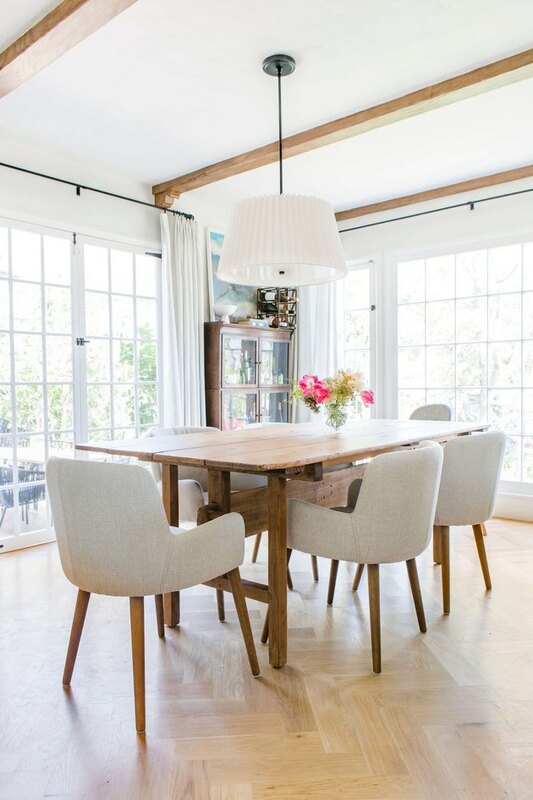 Less is so much more in designer Erin Fetherston's Los Angeles dining room. 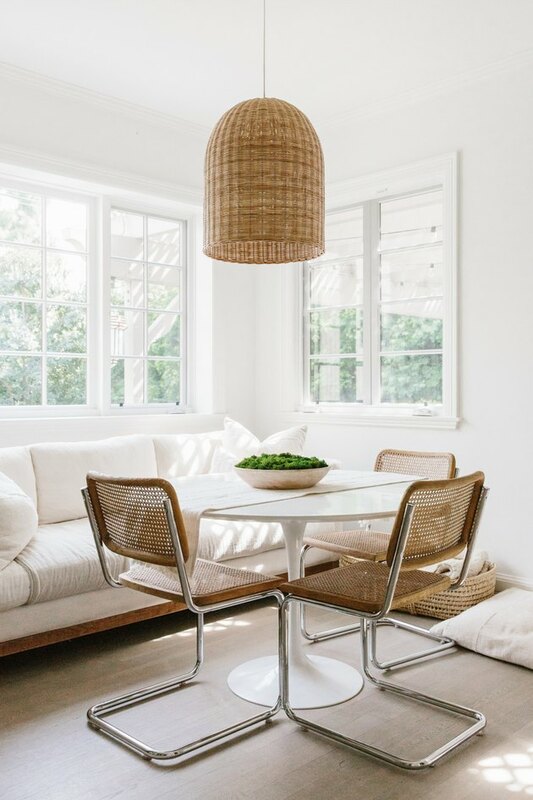 She uses warm neutral accents like hardwood beech Cesca chairs and a bell-shaped woven rattan pendant light to enliven the space. 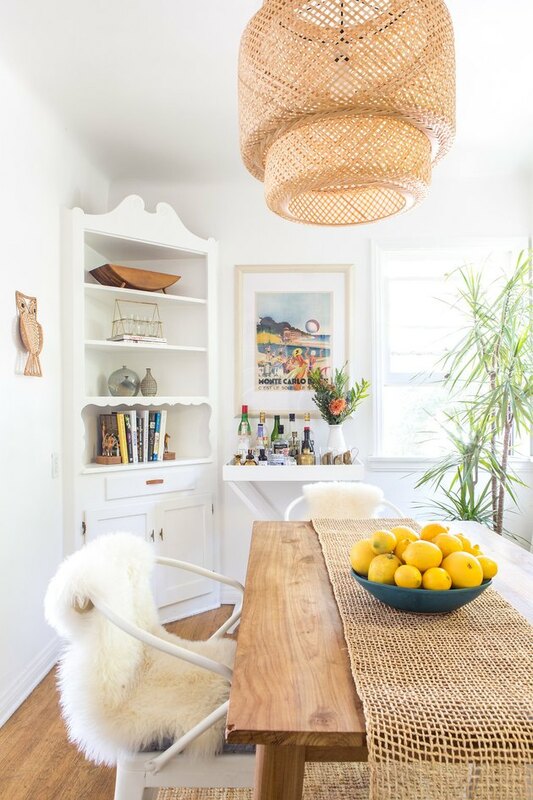 From a sturdy wood table, to white metal chairs covered in plush white sheepskin throws, to a woven rattan pendant light, and a textural table runner, this dining room by Megan Martinez from Boho Beach Bungalow mixes materials right by emphasizing their contrast. 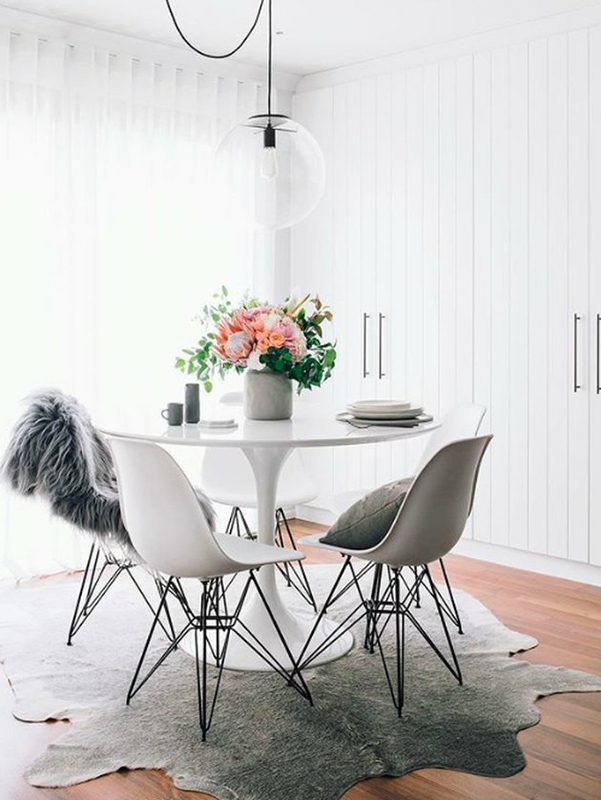 In Perth, Washington, a little bit of texture goes a long way in Tarina's white dining room from Oh.Eight.Oh.Nine. The gray faux fur throw and cowhide rug make the sleek, white tulip dining table and chairs set feel much more inviting.